Quick Shop screened at the Terror Film Festival last Friday, and I’m happy to report that it won the Best Thriller Short Film Claw Award! The cool thing was, I actually had people approach me and tell me they liked my film. That’s a really great feeling, and really validates all the effort that was put into the movie. 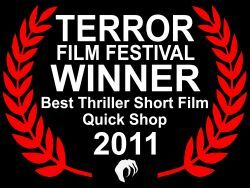 To top off a great festival experience, I learned that Quick Shop had won the Best Thriller Short Film award. I am humbled and honored that Quick Shop was chosen as the winner, and it certainly motivates me to continue making films. I have a few pictures from the festival that I will post as soon as power is restored at my house. Until then, I will relish in the win and continue to promote Quick Shop! This entry was posted in Quick Shop News. Bookmark the permalink. Great news, Martin!!! I wish I had been there. Keep on garnering them awards, my man!